Practice guidelines offer a valuable foundation of information regarding management strategies for a variety of medical illnesses based on the strength of current scientific evidence. 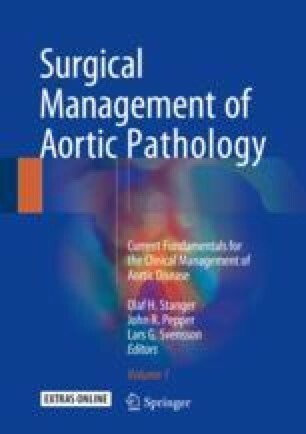 Given the low incidence of thoracic aortic disease as compared with other cardiovascular diseases and the unique nature of surgical practice, however, it is unlikely that there will be many randomized trials to form robust evidences to support recommendations in the guidelines. In addition, there have been growing concerns that practice guidelines will never be completely free of financial and professional biases. In this regard, it is our view that guideline recommendations establish some common ground for discussion regarding decision-making, but they should not be used as sole criterion in clinical practice given the limitations of supporting evidence. Therefore, readers of the practice guidelines should ideally be aware of weaknesses as well as strengths of each cited reference supporting so that they have more balanced sense on the recommendations. In this chapter, we will review current practice guidelines structured according to the clinical setting and location of the aortic diseases as well as their supporting references.